Rev. Charles Ray Marler, 88, entered heaven to meet his Savior whom he had served long and faithfully on Tuesday, November 27, 2018. He was surrounded by his family just prior to his homegoing. He was preceded in death by his parents, Ray Cuthbert Marler and Charlie Pearl Snodgrass Marler, his grandparents, and his sister, Mary Bates. Born in Georgetown, Tn., Ray was a graduate of City High School and Union University. 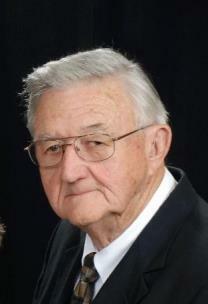 He worked for the Electric Power Board and pastored the Ashport Baptist Church and the Ramhurst Baptist Church. In 1954 he and his wife, Martha, went to Nigeria, West Africa, as missionaries with the Sudan Interior Mission. Upon their return to Chattanooga in 1963, he worked for the Holt Employment Agency and the Volunteer Ammunition Plant before becoming business manager of Tennessee Temple Schools, a position which he held for 18 years. He spent the next 15 years as Personnel and Safety manager of the Chattanooga News Free Press. After his retirement, he worked part time for Chattanooga Funeral Home. A long-time member of Highland Park Baptist Church and currently Ridgedale Baptist, he served as deacon, Sunday School teacher, president of the Men's Bible Class, and in any other position asked of him. He also conducted Sunday services at the East Ridge Retirement Home for many years and served as counselor with Hamilton County Baptist Association mission. He was a member of the Downtown Optimist Club where he served a term as president and was chosen Optimist of the Year. He was also active in the News Free Press Retirees. In August 1948, Ray married his high school sweetheart, Martha Nell Patty. They recently celebrated their 70th wedding anniversary. He is survived by his wife; three children: Patty Ray Hawkins (David), Rick Marler (Joy), and Jennell Marler; grandchildren, Eric Hawkins (Holly), Jenny Hawkins, Kate Duggan, and Aimee Floyd (Seth); great-grandsons, Graeme Duggan and Gavin Ozborn. Baba, as he was known to his family, was kind and loving and possessed a warm sense of humor. Above all, he was concerned about being a positive testimony for his Lord, always concerned about pointing others to faith in Jesus Christ. Visitation will be held on Friday, Nov. 30, from 3-7 p.m. at the funeral home. Funeral services will be held at the East Brainerd Chapel of Chattanooga Funeral Home, 8214 East Brainerd Road at 11 a.m. on Saturday, Dec. 1, with Dr. Bill Owens and Dr. Clarence Sexton officiating. Burial will be in Greenwood Cemetery with Dr. Doug Plumlee officiating. Active pallbearers will be Eric Hawkins, Seth Floyd, Kris Passons, Doyle Pope, Dan Card, Luther Allin and Tom Scott. Honorary pallbearers will be the Friendship Sunday School Class of Ridgedale Baptist Church and Chattanooga Times Free Press Retirees. Special thanks to our friends at Home Comforts and Hospice of Chattanooga for their loving care. In lieu of flowers, memorial contributions may be made to a charity of one’s choice.